The days until the conference are becoming less and less and, surprisingly, I’m not all that panicked. I’m assembling materials to print for the portfolio showcase and that’s going well. I’ll have black and white, half-tome, and color pieces to show, in both traditional media and pixels. A little while back I asked for storybook titles to re-illustrate and this suggestion was made. 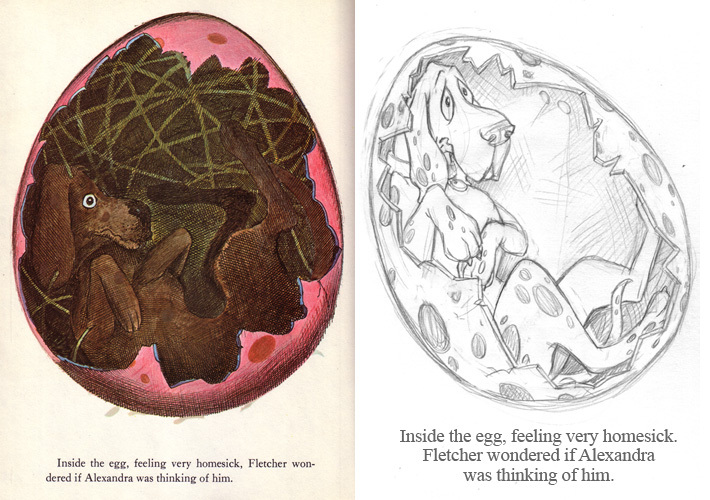 _How Fletcher Was Hatched_ is the story of a dog whose friends, an otter and a beaver, find a way to make him hatch from a giant egg to regain the love and attention of his owner, Alexandra, who lately has a thing for hatching cute and fluffy chicks that go “peep”! 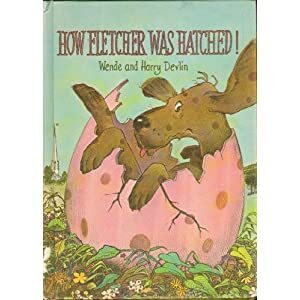 When I was a little girl, I absolutely LOVED this book and Mom read it so well! She deserves a lot of credit not only for fostering a love of reading, but for theatrical reading! She did voices and everything! It’s left a warm and lasting impression. Here was the perfect book for me to do a re-illustration project! An older book, something well-loved, but not an overdone classic, and something I could be passionate about and sink my teeth into. First thing I did was find someone selling a copy of it. It has some mustiness, or mildew in it somewhere, so I’ve got to keep it in a ziplock bag (anyone know about book cleaning? ), which is a bummer, but I’m just so glad to have it anyway! Then yesterday I chose a page. Something that would sum up the story and be an emotional point to show off my ability to portray emotion. Here’s the page I chose and the sketch I did to update it. What’s funny is that while I was drawing this, I began to experience muscle memories. I began to remember that, as a little girl, I had tried redrawing this page already! So, yeah… Really liking this! I’m going to finish this one today! This entry was posted on Thursday, July 28th, 2011 at 7:20 PM	and is filed under Journal. You can follow any responses to this entry through the RSS 2.0 feed. You can leave a response, or trackback from your own site.